I was thrilled to receive a copy of this community cookbook from a thoughtful reader. It’s a first edition, copyright 1947, compiled by the Trinity Lutheran Ladies’ Aid. 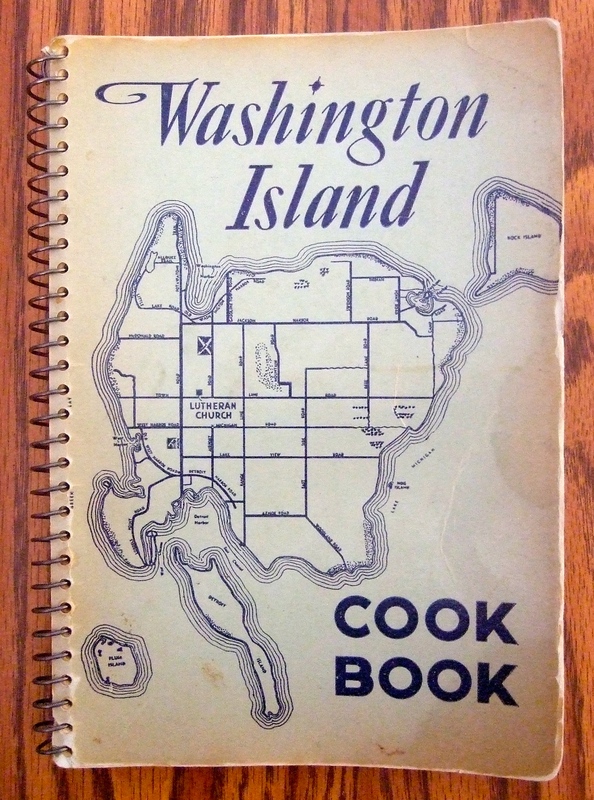 Several scenes from The Light Keeper’s Legacy are set on Washington Island, and the rest are set on Rock Island—visible in the upper right corner of the map on the cover. Both are off the tip of Wisconsin’s Door County peninsula. 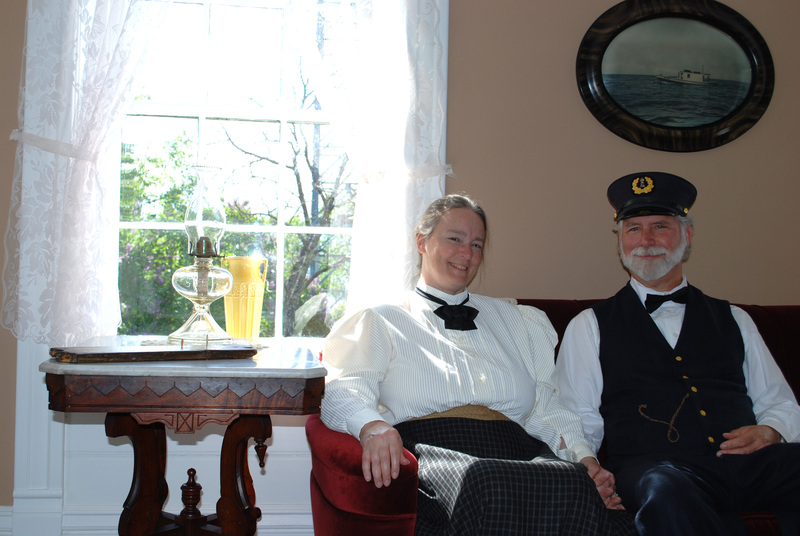 My husband and I have served as volunteer docents at Pottawatomie Lighthouse, in Rock Island State Park, for the past seven summers. The lighthouse has been restored to its 1910 appearance, when Charles and Mollie Boshka lived there with their two children. This cookbook is a treasure for several reasons. First, it includes a number of recipes submitted by Mollie Boshka. Each one is a tangible link back to that lovely woman in the photo. 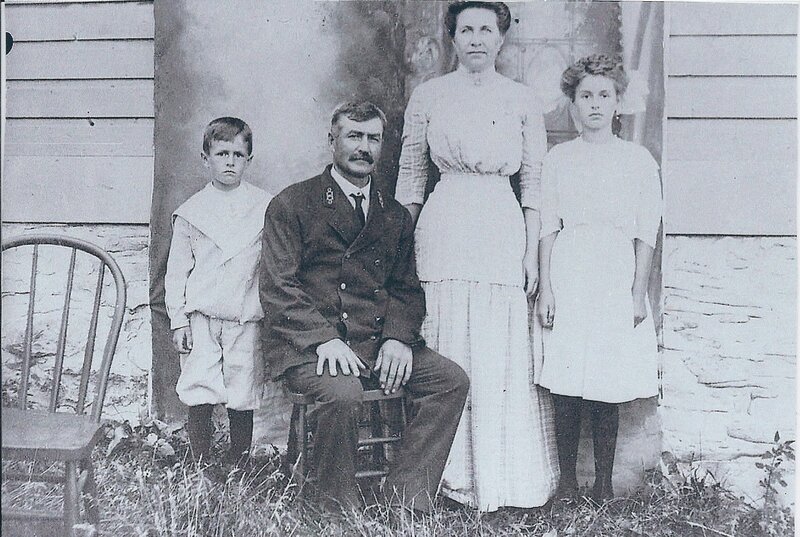 It also reflects the families who settled on Washington Island in the mid-late 1800s and early 1900s. 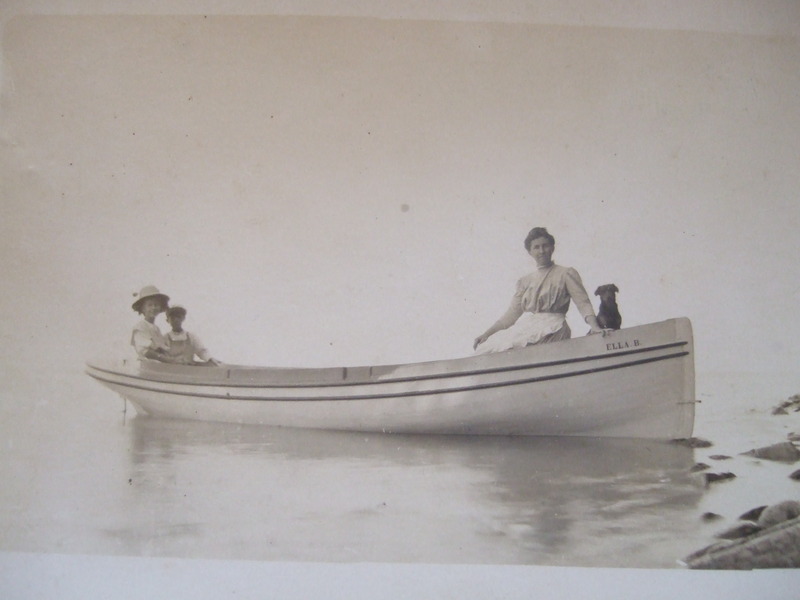 Many of the women’s surnames are still common on the island today. Many of the recipes reflect Norwegian, Swedish, Danish, and Icelandic heritage. Toward the end of The Light Keeper’s Legacy, a Washington Island friend makes Icelandic Pancakes for Chloe. The recipes also capture an era when old traditions were blending with new. The cookbook includes recipes for things like head cheese and vinerbrod (Danish pastry), and many include little or no instruction. The assumption was that anyone using the cookbook would just know how to put the ingredients together, or how hot the oven should be. But the book also includes recipes for dishes like Texas Hash (which calls for 3 Tbsp. of something called “Spry”), Spanish Noodles, and several versions of Chop Suey. 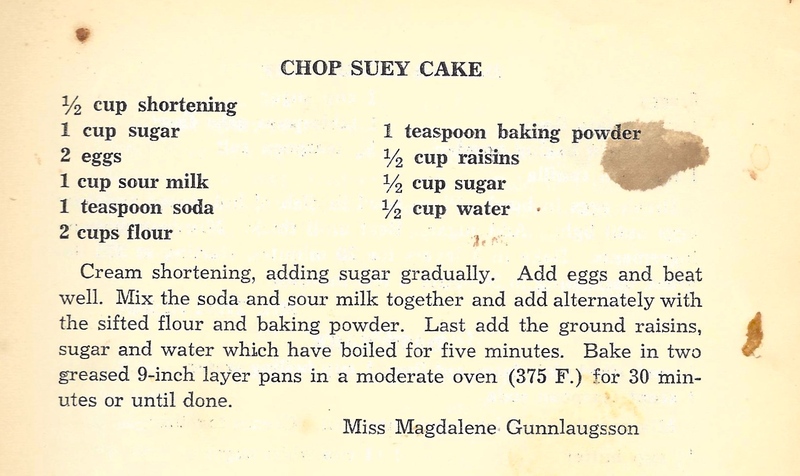 In addition to several main dish recipes for Chop Suey, this one caught my eye. I have no idea how it got the name. Finally, the book tells a story about the woman who once owned it. I’ll never know her name, but I’ve got glimpses of her. She received the book from for Christmas in 1848; the inscription is Norwegian. And she used the book a lot. 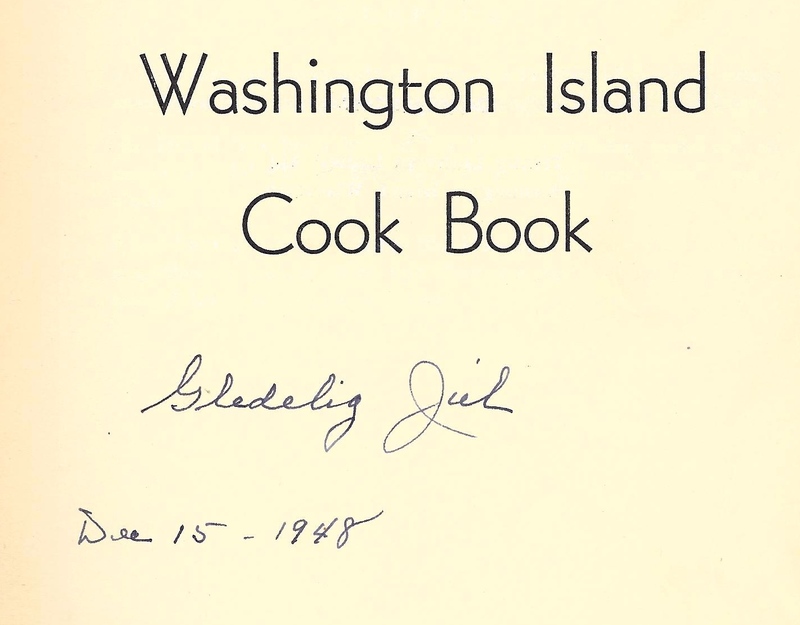 Pages are dog-eared and sometimes stained, and she added notes by some of the recipes. It’s fun to imagine her flipping pages, deciding what to prepare for family or friends. This one made me smile because I grew up eating similar Jello salads. I’m so grateful that this particular cookbook got saved, and passed from hand to hand…and ended up in my kitchen. To read more about the Boshkas, see Making Jam for Mollie. 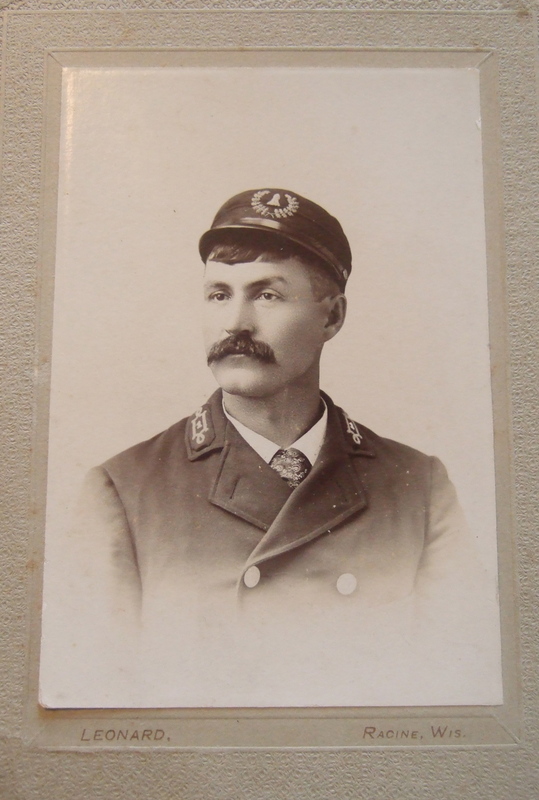 To learn more about Pottawatomie Lighthouse or Rock Island history, follow The Light Keeper’s Legacy link on the right side of this page. 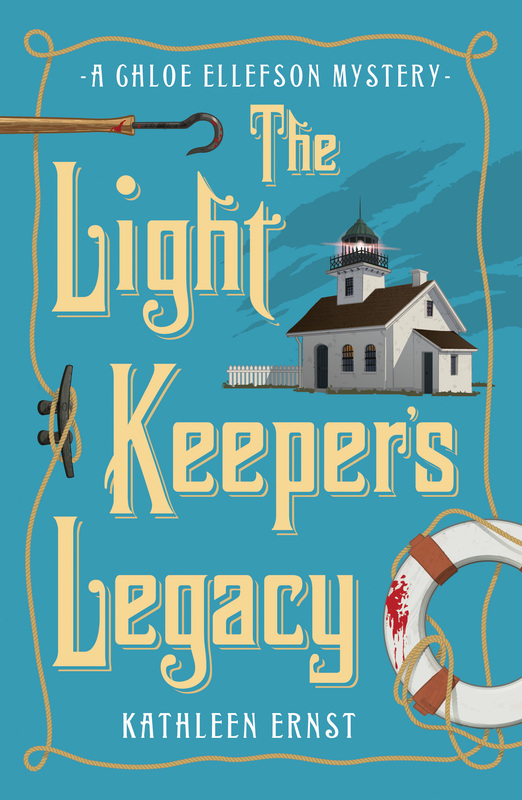 My husband Scott and I have served as docents at Pottawatomie Lighthouse, setting for The Light Keeper’s Legacy (the third Chloe Ellefson Historic Sites Mystery), for five years now. There are lots of stories to tell. 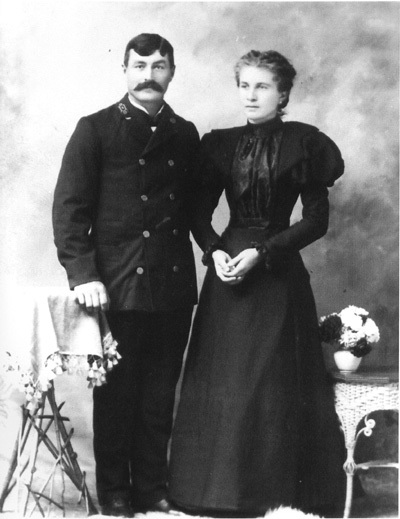 I wove some of my favorites into the book—especially those concerning the Betts family, occupants in the late 1800s. Visitors touring the lighthouse, however, see the structure as it appeared in about 1910. Charles Boshka was head keeper then. Charlie Boshka at an earlier posting. I knew the basic facts of his time there, but until recently, all I knew about his wife Mollie was how lovely she was. This was Charlie and Mollie’s wedding photo. That changed when I had the wonderful pleasure of meeting two of the Boshkas’ descendants. Thanks to the generosity of Connie Sena and Kari Gordon, the handsome couple in the portrait displayed at the lighthouse are a little more real to me now. 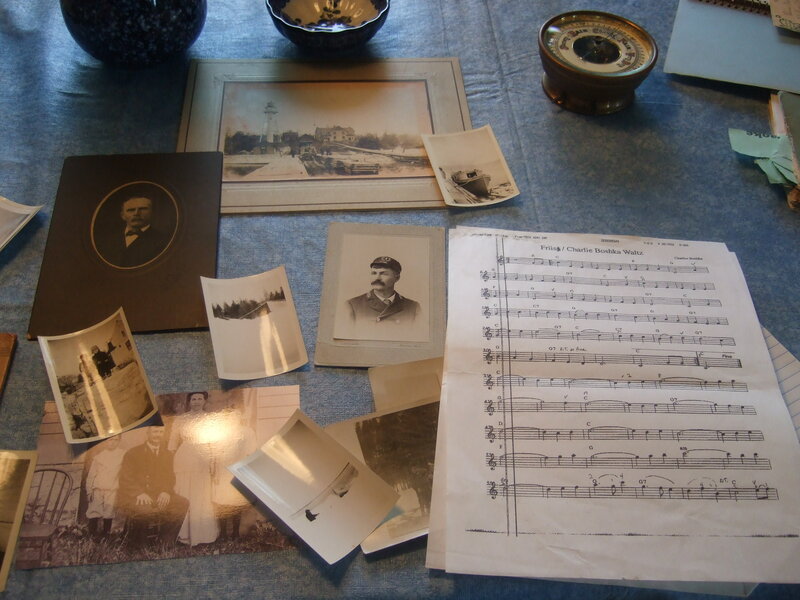 Some sheet music was among the family treasures. Charlie played the violin, and even composed at least a few tunes. Charlie and Mollie with their son, Lucien Nels, and daughter, Ella Josephine. I adore this photograph! It gives a hint of life beyond the daily requirements for lighthouse families. I was particularly pleased to get glimpses of Mollie. She grew roses. 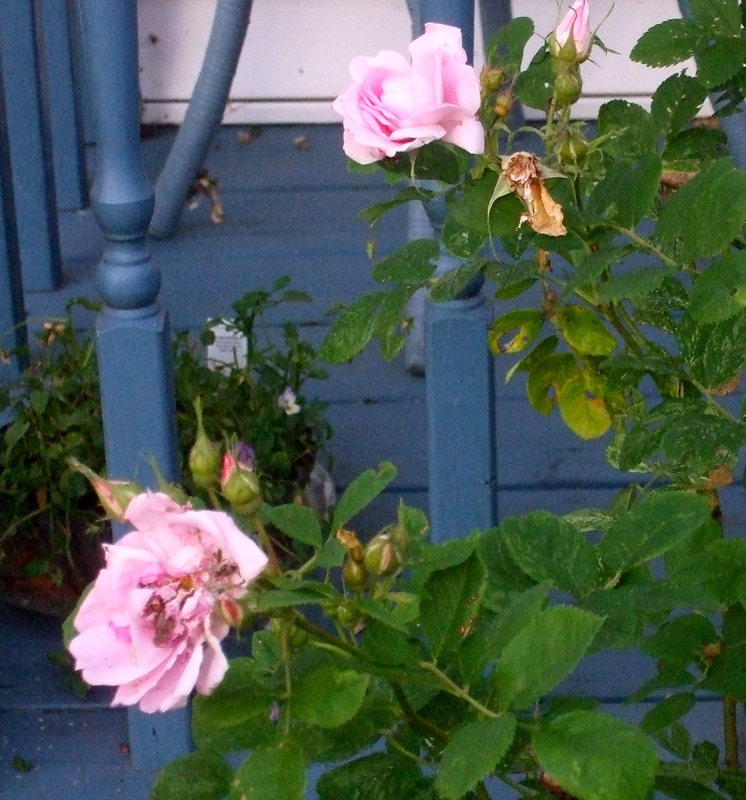 Some of Mollie’s roses still bloom at the couple’s home on Washington Island. And she was a knitter. …and a closer view of her handiwork. 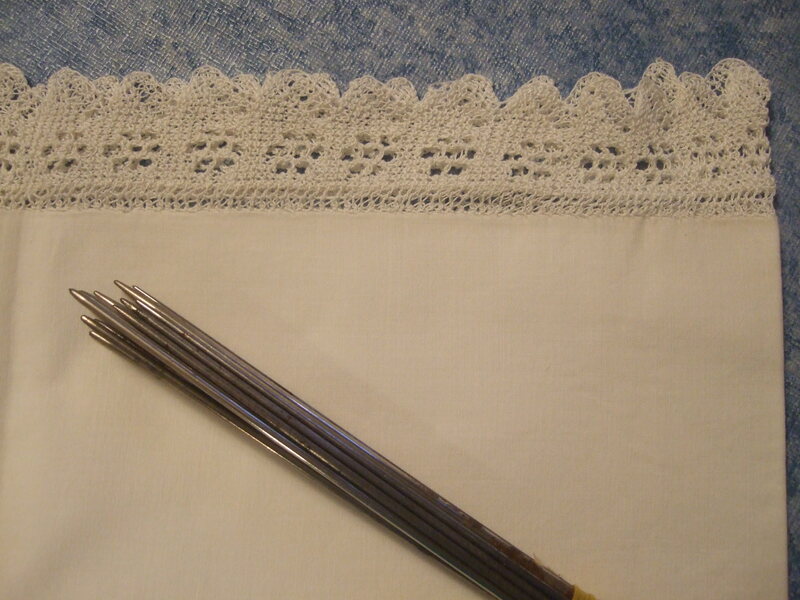 I hoped to find a lace pattern similar to these, practice over the winter, and knit during my stay at Pottawatomie this year. Time got away from me, so—maybe next year. 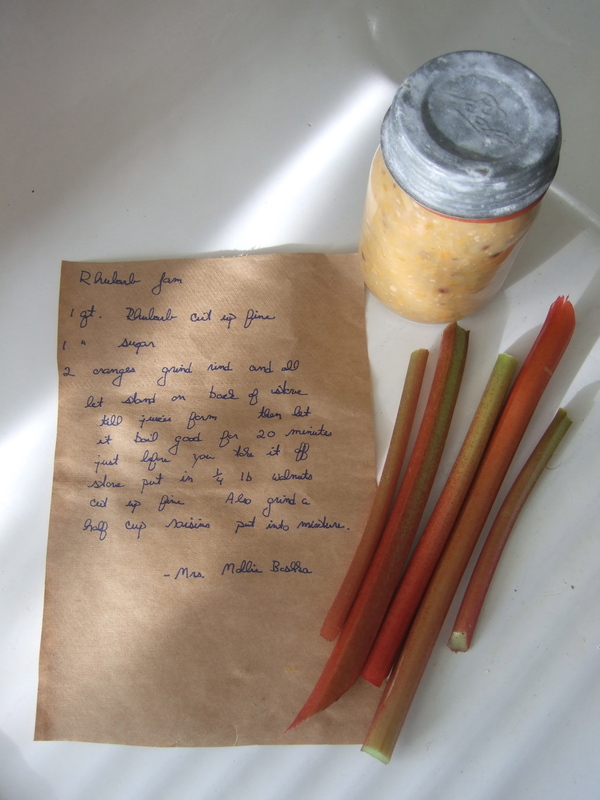 However, Connie shared another treasure with me: Mollie’s recipe for rhubarb jam. 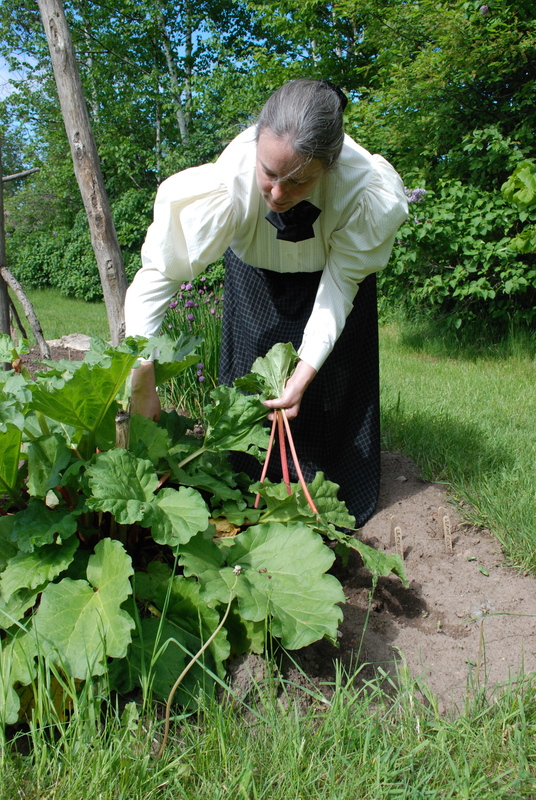 The week Scott and I traditionally stay as docents at Pottawatomie Lighthouse comes right at the peak of rhubarb season. Perfect. That’s me, harvesting from the lighthouse garden. Other than rhubarb, I brought the fixings for Mollie’s jam. I made a batch the day we arrived at Pottawatomie, and wrote the recipe out on brown paper. Scott said the simmering jam made the whole house smell wonderful! An added bonus? The jam was delicious. I kept one jar for display, and we enjoyed the rest on our morning toast all week. Let sit on back of stove until juices form. Then let it boil good for 20 minutes. Also grind half a cup of raisins and put in the mixture. *Note: I omitted the sugar and added a splash of maple syrup instead. Also, I didn’t have a grinder, so I minced the oranges, walnuts, and raisins with a sharp knife. Mollie’s reference to letting the rhubarb sit on the back of the stove harkens back to the days when the back burners of a wood-fired cookstove stayed warm; I stirred the rhubarb, oranges, and sweetener over low heat until it began to simmer. I did not actually can the jam, but I plan to make another batch and freeze it in small containers. It made me happy to bring a little something of Mollie back to the lighthouse. 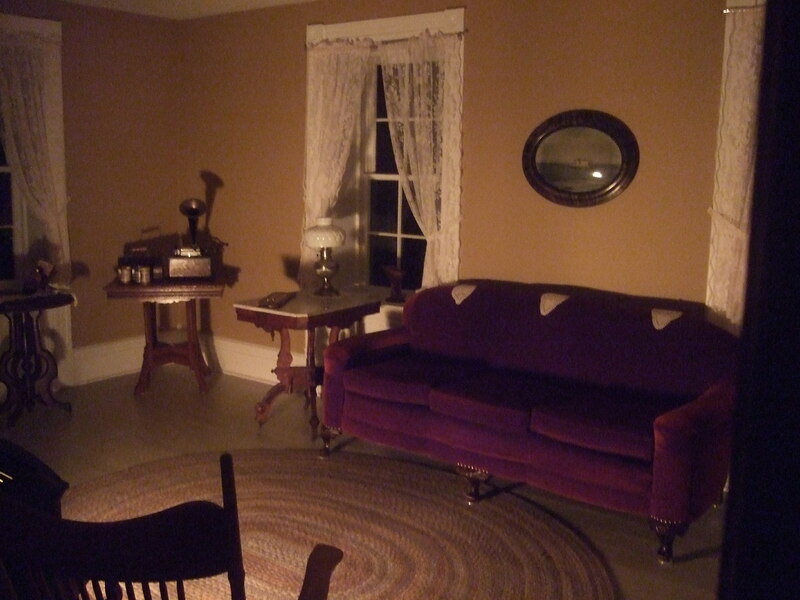 And on chilly evenings, I could almost hear Charlie playing violin in the parlor—just as he did a century ago.